← ASK FATHER: Baptizing with the name “Lucifer”. Today at the ever helpful Crisis there is a piece by Anthony Esolen (who is being persecuted by Providence College – HERE) with thoughts on disposition and sacred worship stemming from the thought of Dietrich von Hildebrand in his work Liturgy and Personality, which is out in a new edition. I warmly recommend both… Esolen and von Hildebrand. If you have never read anything by Dietrich von Hildebrand… whew… are you in for a treat. It is a hard treat, mind you. Under immediately discussion is disposition for participation in sacred liturgical worship. This could be helpful – and a real challenge – for a lot of readers. In other words, the liturgy sweeps us out of ourselves. We do not set about this transformation directly, says Hildebrand. That would be a contradiction. We cannot forget ourselves while assiduously gauging the measure of our spiritual progress. We do not participate in the liturgy for the experience: the ravishment comes “in an entirely gratuitous manner.” The proper attitude of the man being transformed by the liturgy “is like that of love which is entirely directed towards its object, a love which in its very essence is a pure response-to-value, which comes into existence only as a response to the value of the beloved.” Had Dante said, “I think I shall fall in love with this girl Beatrice, because she will enable me to write great poetry,” he would have been but one of the great crowd of poetic poseurs, and could never have written his Commedia. Hildebrand insists upon the necessity of love. If we say, “I shall attend this Mass because it will be good for me,” it will be of no avail. It would be like trying to win the love of a woman by gazing into a mirror. I am determined now to reread Liturgy and Personality. Mind you, the title of this blog post is meant to provoke. There are many levels of benefits that flow from different levels of participation on our sacred liturgical worship. Should we be satisfied with the lesser, when the greater is possible? Hence, there is also a great challenge on the table for PRIESTS AND BISHOPS. Consider ars celebrandi and the knock on effect it MUST have for the congregation. Consider the rite itself! What choices about liturgical worship are going to foster the greater rather than the mere lowest common denominator? The easy path. The utilitarian. Fathers… read and ponder. It’s on us. This entry was posted in "How To..." - Practical Notes, Hard-Identity Catholicism, Liturgy Science Theatre 3000 and tagged Anthony Esolen, Dietrich von Hildebrand, disposition. Bookmark the permalink. My husband is a convert from the Episcopal church since 1996. He read every von Hildebrand book he could get his hands on. He loved this book you are referring to and loved it. — any possibility of a personal Grace given gratuitously by the Lord in Mercy and Forgiveness only makes sense within mourning for sins, love returned for the Love given into our souls and minds and our simple lives, because our love for God is for God Himself, and not for our own worldly purposes. Our Lady Cloaked in the Sun is in the Perfection of the meeting of Divine and Human Love in Beatific Vision. Remember this in your Souls for your Submission in Love and for Judgment before the Throne. Pray to Saint Mary Mother of God to help you there. As you point out at the end, Father, “good for me” needs some careful distinguo. We defected from the Novus Ordo parish of my family’s baptism to our local Anglican Ordinariate congregation largely because I realized that the former was “bad for me”, what with all the teeth-grinding and the ever-present temptation to mock the gender-neutralized Scriptural translations and the hippy-dippy, often quasi-heretical alterations found in the CCCB’s Catholic Book of Worship III. To be clear, our priests themselves were thoroughly orthodox, but the lay-run trappings of the typical Novus Ordo Mass tend to undermine even the most reverent celebration. By contrast, the Ordinariate’s Divine Worship is good for me, precisely because it doesn’t cater to me or attempt to anticipate my need to feel “included”. The liturgical focus is on worship of God before all else, and any distractions I experience are entirely my own, rather than being foisted on me from without by nice people with a deformed liturgical sensibility. Thank you Fr. Z for constantly blogging about the importance of the liturgy – both the holy Mass and the Divine Office. The holy Mass is the most important activity that happens every day! It has the power to save souls and release those in Purgatory. Clerics should not use it as a platform for improvisation or self-centeredness. “Save the liturgy, Save the world” is not a platitude but the truth. That phrase should be on every reader’s mind, car bumper and coffee mug! Re: “it will not avail” — Um. Sort of. Love starts with duty and practice. If you can’t remember to call Grandma because you love her, but you can remember to call Grandma because it’s Sunday and that’s Grandma-calling time, that doesn’t mean you have committed an act of hate or emptiness. If you call Grandma because of duty, it’s not the highest love but it still counts. So of course “because it’s good for me” isn’t the best reason to go to Mass, but it isn’t chopped liver. There’s a reason why Mass is compared to food and drink and medicine. So yeah, take what is good and use it, but don’t swallow anybody’s thoughts uncritically. The utilitarian was enshrined by VII, when suddenly the Mass became a personal experience. But paradoxically, it also became much more collectivist, meant either to entertain the group or form them in leftist political nonsense. So people would have their charismatic woo-woos but with the thrill of being on the side of the “Revolution,” whatever that may have been. That said, a lot of the charismatics eventually emerged as pretty orthodox JPII Catholics – that is, not highly intellectual, a bit too emotional, but basically in line with established doctrine. And I think they were really the ones who saved the VII Church, which many other people had left to go to the Orthodox or the SSPX. Whether this is good or bad I don’t know. 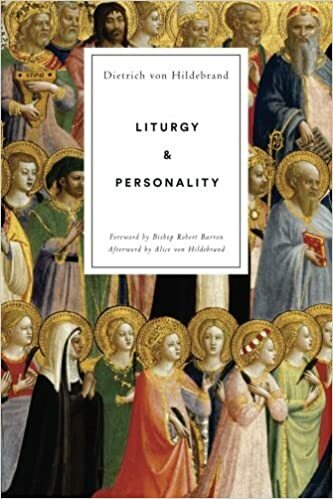 It may be important to note that this reprint has a new introduction by Bishop Robert Barron, which clarifies the English translation of some key concepts, such as “personality”. So, by this reasoning does this not at least discount or more likely totally negate Holy Days of Obligation ? I mean as the Church has Holy Days we must attend for our spiritual good, how then by these authors idioms can we condone going to a Holy Day because the Church says we must ? Would we be better just picking, say a random Tuesday as our “holy day” and be open to whatever spiritual gain we may receive hoping that it negates the Mortal sin of purposely missing a Holy Day of Obligation. Just a thought …. 3) your conscience is pricked at his “rigid” call to perfection (another notable figure once challenged his students to the same…). Why? Because at many parishes today we poor laypeople have to choose carefully among different Masses because of the extensive liturgical aberrations that persist. At my own parish I can no longer go to the Mass if it’s our “weekend associate” because of his ad-libbing during the prayers and his quasi-heretical homilies. Thus, I am forced to say that “I shall attend this Mass because it will be good for me,” because it is indeed good for me when anger doesn’t rise within my soul during a Mass!